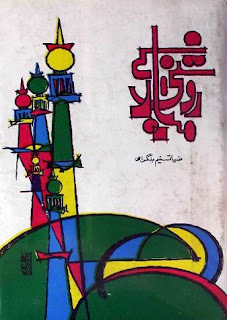 This post is about a short biography of Hazrat Haji Imdadullah Muhajir Makki (Rehmatullah Alaih) written by Famous Authoress Mohtarma Zia Tasneem Bilgrami Sahiba. The authoress uses a multidimensional approach to narrate the historical and religious events of Haji Imadadullah Muhajir Makki RA’s life and his memorable role in 1857 Freedom Movement. Haji Imdadullah Muhajir Makki was an eminent 'Alim, Wali Allah and Chishti Saint of the Indian Subcontinent. Mumtaz Mufti Sahib mentioned the heroic struggle of Haji Imdad Ullah Muhajir Makki RA in his book 'Alakh Nagri' in Chapter ‘Pakistan’. This memorial also sheds light on that struggle in detail and highlights the major reasons of destruction of Hindustan and Mughal dynasty in 1857. Please read it carefully especially highlighted pages (446 to 450) describing economic collapse and major reasons behind fall of Hindustan in 1857. A strange event about Khawajah Khizr is narrated at Page 457. When corruption spreads all over the societies and rulers are not paying heed to God’s law; spiritual forces work against the tyrant regimes to eradicate them. We have already studied in testament of Khawajah Moinuddin Chishti RA post that last Mughal Emperor was granted 27 years by Allah Almighty but he failed to maintain law & order and justice in the country so result was the fall of Mughal dynasty. - Prevention from internal rebellions like Baluchistan rebellion by giving their rights, giving love and peace to them. - Not involve ourselves in wars and conflicts. Do Jihad only if we have Imam (authority) and power. Mughals didn't follow above points. We should follow them. Economic crises destroyed Mughals. Current economic crises will destroy us if we don't solve it. Ceylan Özbudak: If people genuinely believe and are joyful, their artistic prowess grows. Excellent architecture appears. They can make very good films. But if people lose joy, their brains shrivel up. The blood vessels in their brain shrink, no blood reaches the brain. They can no longer think or talk properly. Their horizons narrow. They become depressed. They have no creativity, by Allah’s will. But joy of faith expands one’s horizons. Scientists make great discoveries. People who speak open up our minds. We feel great joy when we enter a store. Or when we go out. It is a chain reaction. It triggers a reaction. When there is unhappiness in society, an unhappy chain reaction is set off. Ceylan Özbudak: We need a bright radiance, or clarity of mind. The brain and its functions collapse under pressure. To be replaced by joylessness. And when you have that, it is like computers being deprived of electricity, they are no use, and neither are such people. Some of them take the life out of people. They ban joy. But people have to laugh and relax. Why ban laughter? Let them laugh. Ceylan Özbudak: The world must concentrate on love. Most people have no love. This is a terrible scourge and people are very unhappy... A disaster. The whole world should be declared to be in a state of emergency. Lovelessness is a terrible affliction. Lack of trust is a terrible affliction. Why should people fear other people? It is a disgrace for people to fear one another. People should love one another with joy. Hate and fear is more difficult than friendship and love. Orhan Ozturk: MANY MOVIE STARS AND SINGERS HAVE BEEN THE VICTIM OF DARWINISM AND MAETERAILISM, LOVELESSNESS AND THE IDEA OF HAVING MORE FAME OVER ONE ANOTHER HAVE RADICALLY PUT PEOPLE INTO A VERY AWKWARD STATE OF MIND. AS A RESULT OF UNSATISFACTION, ALCOHOL DRUGS AND FRENDSHIPS THAT ARE BASED ON SELF INTEREST AND GAIN EVEN ADDS MORE TO THE BLINDNESS OF NOT SEEKING FOR THE APPROVAL OF GOD. SPARING HIS HEART FOR THE SAKE OF HIS OWN GOOD WILL WITH A FAITHFULL HEART FOR THE SAKE OF GOD, WILL BRING HAPPINESS AND TRUE JOY. THIS WILL BENEFIT HIM IN THE HERE AND HEREAFTER. WHEN ONE FORGETS TO THANK GOD AND HAVE NO THINKING ABOUT THE MANY BLESSINGS OF GOD, PEOPLE FORGET WHAT LOVE AND COMPASSION IS, AS A RESULT FROM THAT POINT, PEOPLE USE THE WORK OF SATAN FOR SHEDDING BLOOD AND DESTRUCTION AND CRUELTY IS HIS OWN WAY OF LIFE. WHEREAS SATISFACTION OF LIFE CAN ONLY BE ACHIEVED WHEN ONE FEARS GOD AND SEEKS FOR THE MERCY OF GOD. THE HEART BELONGS TO GOD WITHOUT LOVE THE CELLS IN OUR BODY BECOME STRESSFULL AND ATTACKS THE BODY FOR A CALL TO THINK MORE CONSCIENTIOUSLY ABOUT THE FLAWLESS CREATION. THE AIR WE BREATH, THE EYES WE SEE, THE TONGUE WE TALK WITH, ARE ALL A HEAVENLY GIFTS FROM OUR LORD. THIS THOUGHT GIVES A PERSON A MORE LOGIC AND SENSIBLE WAY OF THINKING AND UTMOST HAPPINESS IN A HEALTHY SOCIETY. SUDDEN DEATHS FROM BAD HABITS AND SUICIDAL ATTEMPTS CAUSED THROUGH CARELESSNESS GIVES AN INVITTAION TO SAD ENDINGS. THE ROOT OF THIS TRAGEDY IS THE CAUSE OF A DARWINISTIC AND MATERALISTIC WAY OF LIFE, MAY ALLAH GUIDE US TO THE PATH OF THE RIGHTOUSNESS NOT THOSE WHO HAVE GONE ASTRAY, AMEN. Ceylan Özbudak: Peace should be upheld with patience and persistence, brotherhood should be upheld, love should be upheld... Upholding peace, brotherhood and love has such an interesting structure. That is they never come to a deadlock, they constantly progress and move forward. But they should be continued very persistently and very determinedly. Ozkan Hasan: I’m afraid Sheytan is real. Since Adam and Eve he’s done a lot of damage. Now he will lead the world into Armageddon. That was his plan since the very beginning. It’s taken him all this time to prepare for it. Now with technology Sheytan is finally ready to prove his promise to Allah, that man was not worth the rank (makam) Allah gave us. But then Imam Mehdi and Jesus will appear, and they will tell Sheytan ‘We’ are man also, and we are worth it. And the they will prove it and destroy all those working for sheytan. Added two more pages at the start which were missing. Now its complete. Nice read, also negates the propaganda of qadiyanis about shamili jihad. Yes there are things that can not be explained. Habibullah is mentioned in Hazrat Naimatullah Shah Wali RA predictions, As I told in Orya Maqbool Jaan's post of December. InshaAllah, Allah will send a Habibullah to help our nation. Spiritual forces work in strange way so anything can happen. You will see such strange events in next posts also. ISLAMI TEHREEKON KE NAKAMI KE AIK ZAHIRI WAJA YE SAMNAY AATY HAI KE ISLAM DUSHMANON KO HAR ZAMANAY MAIN MUSALMANON KE GHADARON KI KOI KAMI KA SAAMNA NAHI KARNA PARTA HAI.YE WATAN O MAZHAB FIROSH NAAM KE MUSALMAN APNI IHSAAS E KAMTARI YA APNAY NAFAS KE GHULAM BAN KAR MUSLIM DUSHMAN LOGON KE HATOON MAIN KHELTAY HAIN AUR APNAY DUNYA O AAKHIRAT KO BARBAD KAR DATAY HAIN.HUM ALLAH SE DUAA MAANGTAY HAIN KE YA ALLAH IN GHADARON KE SHARR SEY MUSALMANON KO MEHFOOZ RAKH!AMIN SUMMA AMIN! salam, i was wondering if it was possile for you to have the comments shown at the bottom of the page when a link is opened. at the minute, one clicks on a link, the page loads (usually full of visuals, hence taking a while), one then goes to the bottom, clicks on comments and the same page loads again and comments a the bottom appear. it would be possible to avoide the hassle of reloading the page if the commetns could be made visible in the first page load. many thanks. Yes its really annoying,I will try to fix this, actually blogging technology has not matured yet. Google is working on this by adding new features, I think they did this to avoid the load of comments at default load. shukria brother. i understand google's perspective too but i believe the settings should be as one likes them to be ie flexible. Aaj main phir bohat afsurda hon. Aaj humarey watan-e-aziz main Valentine baray zor-o-shor say manaya ja raha hay. I am feeling very frustrated as I am one of very few who dislike this andhi taqleed of western culture. Humara kiya hoga...yeh sooch sooch kar dil bohat dukhta hay. You can read the transcript of this video in above link. Brother Afsurda Na hun. Ye waqt sabr se kaam lene ka hai, Actually Allah ki hikmat yehi hai. Preshan na hon. Sub Saints ko pata hai ye kya ho raha hai but sub sabr kar rahe hain. Aap ghaur karain baat samajh mein aa jaye gi k asa kyun hai. Sub theek ho jaye ga. Ye khali tasalli nahin. iss ki solid reasons hain jo mein post kar dun ga kisi din. Jab marz barh jaye tabhi to operation karna parta hai. Yaqeen rakhain Pakistan ko kuch nahin ho ga. InshaAllah. Asal baat nazron se poshidah hai. Allah se dua karain, Pakistan ko kuch nahin hota, ye baat mein puray yaqeen se keh raha hun. Allah ki merzi hai k ab waqt kab change hota hai. Allah se shikayat nahin karte kabhi. Jo Allah ki raza. InshAllah Allah ache din laen ge. Things aren't that bad that they picture. If you live some where else then don't cry for it. be a part of it again then comment. How come fly sits on bloody wounds only?